“Galette” is a fancy (probably French) word meaning: open faced pie. This can be a super duper fast yet kinda fancy weeknight meal or last minute appetizer if you play your cards right. To make it snappy, it does require two things to have on hand: leftover cooked sausage and frozen pie crusts. After that you kinda just fill it with whatever else you have on hand – spinach, squash, or simply meat and cheese. For my recipe I started with fresh sausage, so used the fat from that to cook everything else in. Either way, as long as you have the frozen pie crust on hand it’s a quick throw together for last minute guests. This is kind of how you fold it. 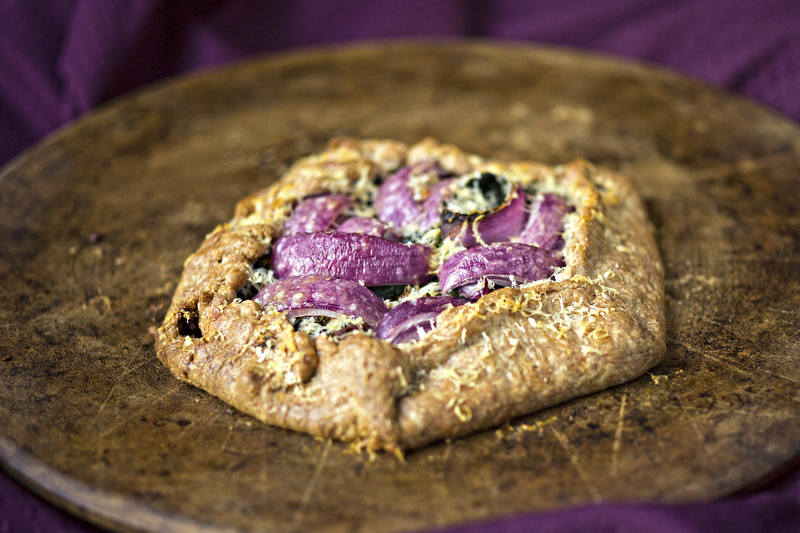 A “galette” is really just an open faced pie that’s lost its pan. It’s pizza-like (assuming you’re making a savory galette anyway), though with a stiffer and crispier dough. I cooked mine on a pizza stone but some parchment and a cookie sheet does the job just as well. If you are the type to make your own pie crust, by all means GO AHEAD. I do not make pie crust because I don’t really make pies, or really bake at all. I have like 2 cookies up my sleeve that I’ll whip out when I have to, and one of those recipes involves a box of cake mix and a brick of cream cheese. Onto my recipe notes, if you’re using already cooked sausage, thinly slicing them will work swimmingly. The only thing about a galette is you want to make sure nothing you are putting in there is too terribly wet, as the middle of the crust will get soggy. So stick to a more minimal sauce (like pesto or just a light brushing of olive oil) and use that jar of marinara another time. Preheat the oven to 400. Make sure your pie crust is room temperature and thawed (if using frozen) and put it on a pizza stone or parchment lined pan, reserved for filling time. Heat a pan over medium high heat and cook your sausage all the way through. Remove to a plate lined with paper towels, leaving some of the fat in the pan for cooking the other stuff in. If there is an excess amount, pour some of it out. Add the kale plus 1 tablespoon of water to the pan, cover, and let steam until well wilted, about 5 - 7 minutes. Remove to a colander and let cool. Put the pan back on the heat and add the fennel, sautéing until soft and starting to brown, about 5-7 minutes. Meanwhile, start filling the galette. Leaving a 1-2 inch rim, spread the pesto (or brush some oil) on the pie crust. Add the meat. At this point, the kale has probably cooled enough. 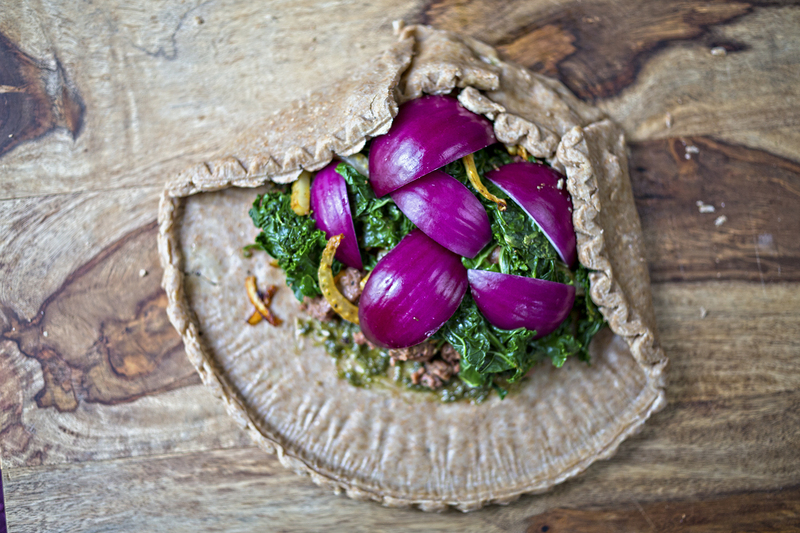 Squeeze any excess moisture from the kale and add to the galette, spreading it out. Add the cooked fennel, and spread out the raw onion pieces on the top. Fold up the edges of the pie crust, creating a fold where it needs to overlap. Sprinkle the top of the whole thing with parmesan, making sure some sticks to the crust. Bake at 400 for 30-40 minutes, until the onions have roasted and the crust is just starting to brown. Serves 2 for dinner, 4 for an app. Non-game substitution: You can use any kind of meat here – steak and sliced fingerlings would be tasty, or shredded chicken for a kind of inside-out pot pie rendition.